It’s important to light your bathroom right! 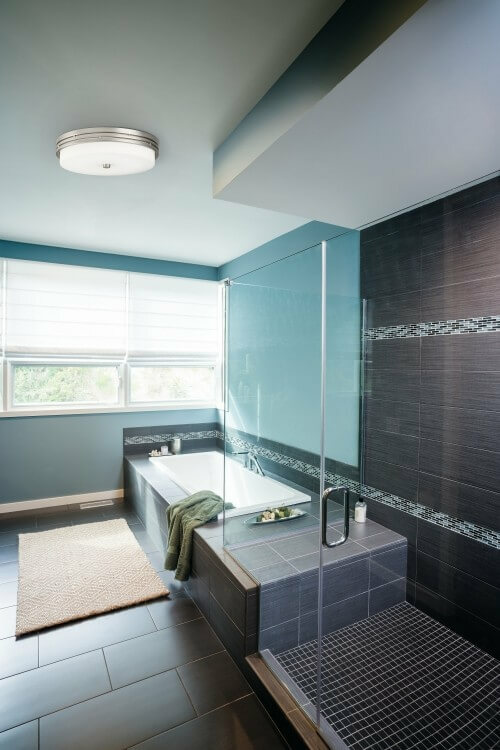 We offer a wide variety of bathroom light fixtures that will transform this important space into a place that serves your needs and looks terrific, too. But since it can be hard to decide, or to know what you need for your bathroom, we put together this guide that will help you answer all your questions. Remember, you can call us at 1-866-688-3562 if you need advice or assistance. What bathroom light fixtures do you need? What size bathroom light fixtures do you need? What style bathroom light fixtures do you want? First, you’re going to need vanity lights for your vanity mirror. These help you see yourself in the best light at the mirror and play an important role in illuminating the whole room. In some smaller or older bathrooms, the vanity light may be the only light fixture in the room, too. There are two ways to illuminate a vanity: bath bar lights and wall sconces. Bar lights are mounted above a mirror and feature multiple light sources all in one row. 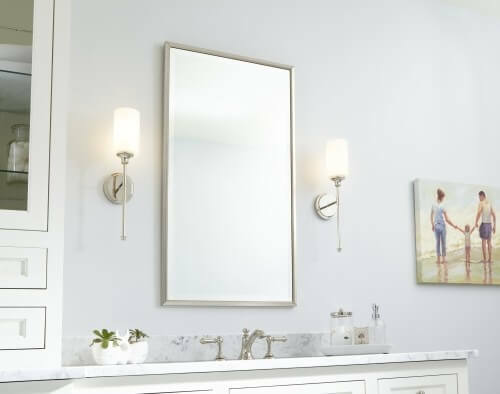 Sconces are mounted beside the mirror and sometimes feature just one light source. 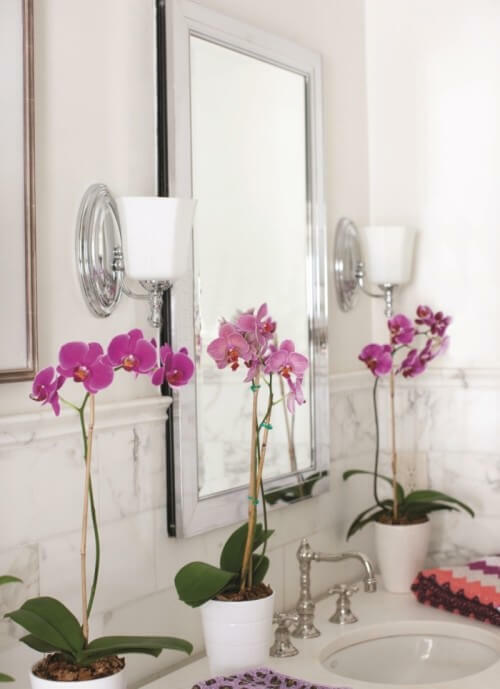 We do like the flattering way that sconces light up your face, but we also understand that it may not be possible to use sconces in every bathroom. If you need to use a bath bar light, that’s fine too. 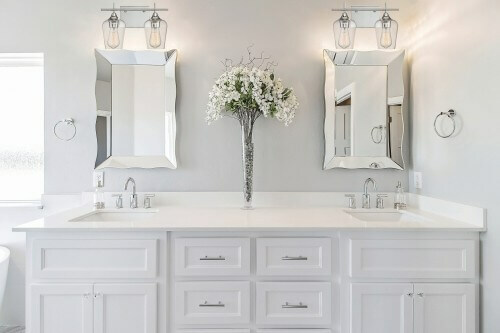 In addition to vanity lights, you can also add ambient overhead light through fixtures such as ceiling flush mounts, ceiling semi-flush mounts or even chandeliers. These hang in the middle of the room to provide more light and more style. 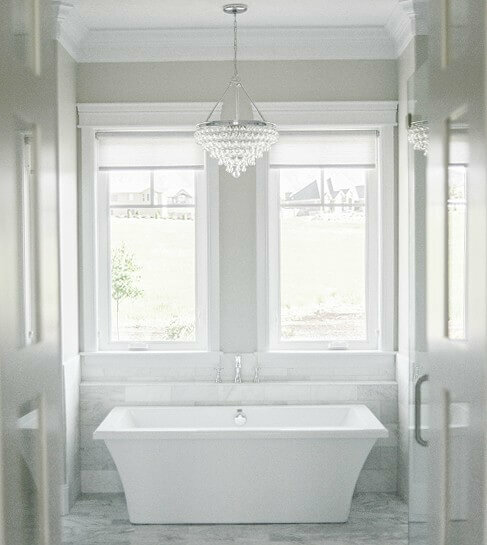 You might also see chandeliers or pendants hanging over a standalone bathtub, like in this example from Crystorama. If you want to add a light here, make sure it is damp area rated so that it can combat the indirect moisture and condensation from the tub. Also, confirm that your local electrical code allows you to hang lights over a tub at all. It may ban the practice or restrict it with things like minimum hanging heights. If you want to add a light in a shower enclosure, it absolutely must be wet area rated. Recessed lights are used in this area to add a little touch of light. Other than these two special use cases, you don’t need to worry about if your bathroom light fixtures are damp area rated. Bathrooms come in all shapes and sizes, from tiny powder rooms to lavish en suites, so make sure to get the right size bathroom lighting for your needs. Measure the width of your vanity mirror in inches. That number will be the limit for the width of bath bar lights. Many people choose vanity lights that are about 75 percent the width of the mirror and center the light above the mirror. For example: If your mirror is 36 inches wide, 75 percent of that is 27 inches, so a bath bar light of about 26 to 28 inches would work. You can also choose to use a bath bar light that is exactly as wide as the mirror. If you have two sinks, try choosing two smaller bath bar lights and centering each one over each sink, like in this example from Savoy House. For an average size bathroom, buy bathroom sconces that are about 18 inches tall or a little less. For smaller spaces, try smaller sconces of 12 inches or less. In a larger bathroom, you could try sconces that are 19 inches tall or even taller! Place the brightest part of the sconce at 66 inches up from the floor because that is considered a general eye level, but you can modify this as needed based on the different heights of your home's occupants. If the sconces have shades, put the bottom edges of the shades a little below eye level. Measure the length and width of the bathroom in feet. Then convert this number to inches by adding them together. This is the ideal width of the fixture. For example: An 18-inch wide fixture would be ideal for an 8’x10’ bathroom. The standard height for hanging ceiling lights is 7 feet above the floor. Now that we have talked about the aspects of bathroom lighting that you need, let’s get to the fun stuff: what you want! We offer bathroom lights in a variety of design styles, but the 3 most common are traditional, transitional and contemporary. Traditional style bathroom lights often feature elegant designs adorned with decorative touches. Transitional style bathroom lights offer a less adorned, more streamlined look than their traditional counterparts. Contemporary style bathroom lights showcase a streamlined, minimal flair. You may also see design themes like coastal, industrial, rustic, farmhouse and Art Deco in bath light fixtures. Let’s also talk about bathroom lighting finishes. The old design rule of thumb was that your lights had to match the finish of your hardware, such as your faucet, towel bar, drawer handles and shower head. While it is still perfectly fine to match these finishes, you can also mix finishes in the same room. Try pairing a warm finish, like brass or bronze, with a cool finish, like nickel or chrome. Or pick out a primary finish and contrast it with lighting in a different finish! We hope that this guide has answered your questions about bathroom light fixtures! Want to see more ideas? 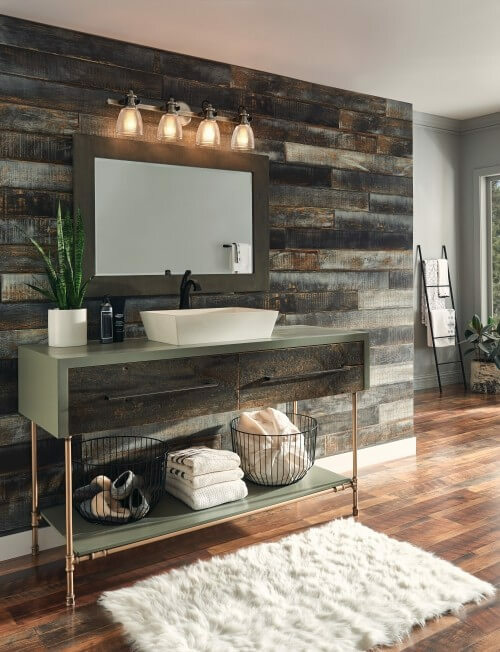 Check out our Bathroom Lighting Ideas board on Pinterest. If you need more advice, feel free to live chat with us, contact us or call 1-866-688-3562.